Dutch Springs is the perfect venue for any event. With a beautiful lake backdrop, Aqua Park, Aerial Park, and lots of lake activities there’s something for everyone. We’ll do the work—you’ll have a blast. Put some play in your day! More People – More Splashes – More Smiles! Groups of 10 or more can take advantage of our special group rates! Any group you can think of! We have hosted groups from many different locations including, Pennsylvania, New Jersey, New York, Maryland, and Delaware! 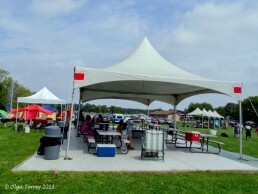 Party tents are available to rent for your day! Give your group a place to meet, keep their things, eat lunch, relax, and enjoy some shade during their day at Dutch Springs! Tents are available for half day, full day, evening rentals and extended day rentals! Groups are encouraged to reserve their tent at least two weeks ahead of time. Contact a Memorable Events Coordinator at 610-759-2270 or fun@dutchsprings.com to schedule your group outing!